Some many times we hear the phrase “Going Green.” It is often said, but what exactly does it really mean? To some maybe not a lot, but at Spectrum Printing Company it means everything. Not only do we try to print in an eco-friendly manner - our employees follow a "green" lifestyle by cycling to work in the morning. 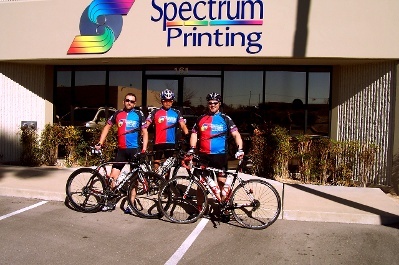 Pictured here is our Production Manager Ken Huizenga, Lead Press Operator George Villanueva, and Lead Bindery Operator Bob Schuster donning their Team Spectrum cycling attire. We appreciate them keeping our planet greener and standing up for the beliefs of Spectrum Printing Company. Please visit "Make Your Business More Sustainable" for information about what services and products we provide in order to keep our humble planet a clean healthy place to live.